VFD stands for Variable Frequency Drive and is widely used in Industries for running Motor. Variable Frequency Drive is used for Speed Control of AC Motor. VFD is also known as Drive or Inverter , It is named as Inverter because the power supply to VFD is first converted to DC by rectifier and then DC to AC by inverter. We will see that how the VFD works , its internal structure. The output of VFD is based on PWM technique (Pulse Width Modulation). The rectifier converts the Incoming AC power supply to DC and then Inverter Convert this this regulated DC supply to variable frequency output. How does the Drives do it ? The inverter output is PWM based , how often you switch from positive pulse to negative pulse determine the frequency of the output waveform. The faster is the switching , more is the frequency. See below picture. 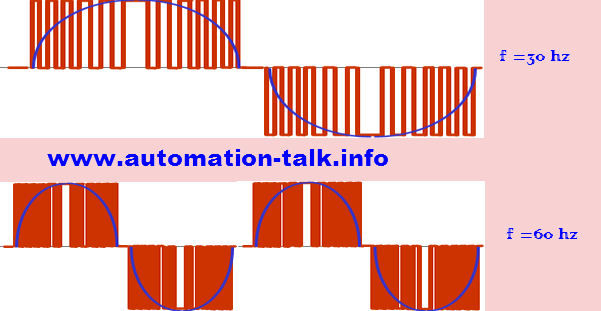 In this presentation on Variable Frequency Drive Detailed description is there on VFD operation and its internal structure.Subscribe to Automation-Talk by Email.